The response to the murder of four Israelis praying at a synagogue in Jerusalem on November 18 was, in some quarters, one of jubilation. Other Palestinian groups were less oblique. The Popular Front for the Liberation of Palestine (PFLP), which claimed responsibility for the murderous attack, described the terror operation as “heroic” and handed out sweets on the streets of Gaza. In Britain, it is not the equivocal response of Fatah that draws sympathy from various political and religious groups, but the forthright violence of Hamas and the PFLP. On September 28, a British Marxist group, the “Tricontinental Anti-Imperialist Platform,” organized in central London an event entitled, “Gaza and the Palestinian Revolution,” featuring, as its main speaker, Leila Khaled. In 1969 and 1970, Leila Khaled, armed with several hand grenades, hijacked two planes. She was released by the British government as part of a hostage exchange deal. Today, Khaled is still a member of the PFLP’s central committee. Not all support for the PFLP, however, is confined to the extremes. Christian Aid, one of the UK’s largest charities, funds and supports Palestinian NGOs openly managed by PFLP operatives. Brahimi is an Algerian national who took part in the “Gaza Freedom Flotilla” in 2010 as a passenger aboard the Mavi Marmara, which was raided by Israeli forces. His organization, the PPDP, was officially established in Britain in 2007. It held its inaugural event at the British Library in London. The event was organized by Interpal and a number of other British Islamic charities accused of belonging to the Union of Good — a coalition of charities that works to obtain the financial support for Hamas’s political and terrorist activities. The British Library event, however, did not mark the actual beginning of the PPDP. The group originally seems to have been a project managed by Interpal itself, which was in operation as early as 2004. Interpal, a leading British Islamic charity, is designated as a terrorist organization under US law. 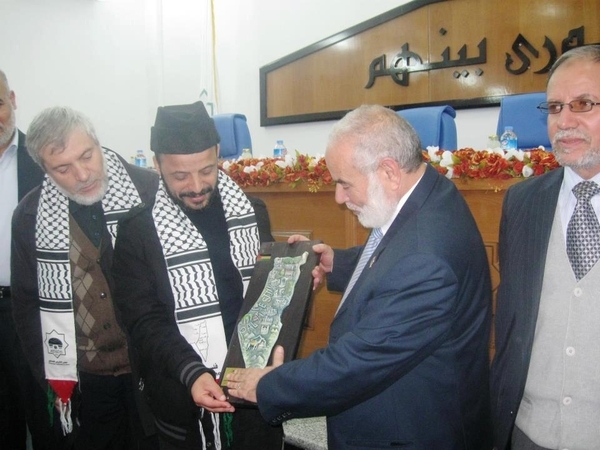 Interpal’s officials regularly meet with senior Hamas leaders. In 2006, a BBC documentary accused Interpal of funding Hamas front groups in the Palestinian territories. Notwithstanding the evidence, Interpal received £536,000 of taxpayers’ money from the British government in 2012 through a tax relief scheme named Gift Aid. Today, the PPDP, which operates out of Gaza, maintains an office and bank account in the UK through which it privately raises funds. Directors listed on the PPDP’s registered company in the UK include Interpal trustee Essam Yousef. 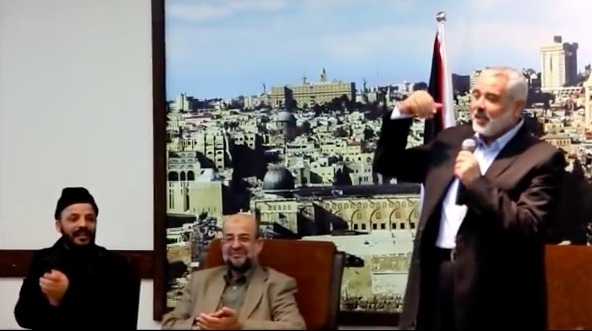 Moreover, the PPDP does not attempt to hide its affiliations – it has its own weekly program on one of Hamas’s television channels, Al-Quds TV. While officially, the PPDP provides loans and grants to help “empower young people and help reduce unemployment through education,” its main role is to finance and manage the Miles of Smiles initiative, a regular expedition of convoys established in 2007. Miles of Smiles supplies the Hamas government’s welfare programs in Gaza. The convoys are supported by the Union of Good, but are chiefly organized by the PPDP and senior Interpal trustees. Several times a year, Ahmed Brahimi and Interpal trustee Essam Yousef lead the convoys into Gaza, where they are welcomed by senior Hamas leaders. The PPDP’s Ahmed Brahimi (left) and Interpal’s Essam Yousef (center) with Hamas Prime Minister Ismail Hanyieh (right). Ahmed Brahimi with Ahmad Bahar, a senior Hamas official who has called for the killing of Jewish children across the world. In Britain, declarations of disgust for specific acts of terrorism often seem designed merely to shroud tolerance for pro-terror views. The Guardian, for example, condemned the synagogue murders in Israel and described Hamas’s celebrations of the attacks as “depressing”; but a mere four days before the terror attack, the newspaper published an opinion piece by Hamas official Ahmed Yousef, which set out to defend the Hamas charter, a document that explicitly calls for the eradication of not only Israelis but Jews. Debates between politicians and commentators over the causes of radicalization and extremism in Britain invariably focus on how to tackle support for groups such as ISIS and Al Qaeda. But why is it that Hamas and PFLP are deemed moderate, regardless of how many civilians they murder? One enormous factor in the spread of Islamic extremism surely must be the networks of charities that seem to support Palestinian terrorist organizations – networks that include groups such as Interpal and the PPDP. Will these organizations ever be shut down?